Now if we have our inventory we can start adding new weapons! We won’t be doing shooting / reloading in this post. Let’s focus on basics first. For this post I will use assets from Unreal Marketplace. I’ve chosen Military Weapons Silver. Create new Enum named WeaponType and add: Pistol, Rifle and Shotgun to it. You should know how to add Enums from reading Adding Inputs Tutorial. First we need to create base class for all of the weapons. Each weapon will extend from this class. Thanks to that we will be able to do some functions on them like Fire, Equip or getting variables like Ammo without knowing the exact weapon. This will be something like object-oriented programming. Those will be used to attach the weapon to FPP or TPP meshes. This will hold information for animation blueprint. Hands need to update animations for different weapon types. For now it’s it. Later this blueprint will have variables like CurrentAmmo, MaxAmmo etc. Before we go further we need to update WeaponBackpackItem structure we had created earlier. WeaponToSpawn shouldn’t be Actor. It should be Class reference to BP_BaseWeapon. We will be using SpawnActorFromClass node later and we need reference to the class not to the actor. 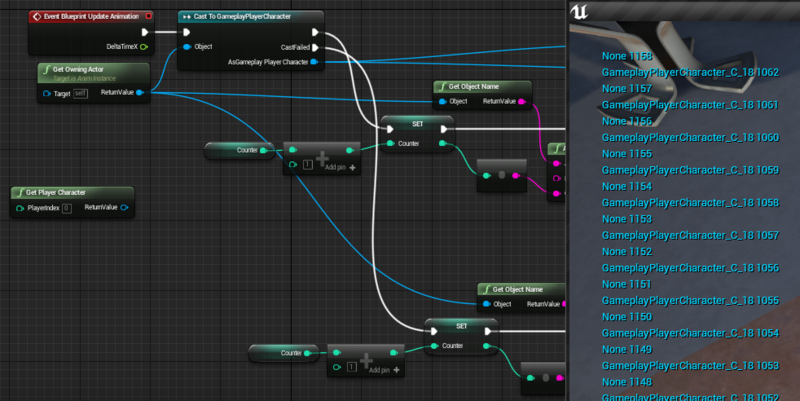 USEFUL TIP: If you change structure variable name or type everything connected to it in blueprints will be disconnected! You need to double-check if everything is connected after changing something in Structures. Create new blueprint based on BP_BaseWeapon. Name it BP_Weapon_Pistol. After that you will be able to see variables created in BP_BaseWeapon and you can overwrite them! That’s all here, let’s create another weapon. Again create new blueprint based on BP_BaseWeapon. Name it BP_Weapon_AssaultRifle. The same thing as above. WeaponType should be Shotgun, AttachSocketName_FPP should be S_Shotgun and WeaponMesh Shotgun_A. That’s it. We have three weapons now! On the left side you are seeing bones from skeleton. You can create sockets connected to bone. It can have relative location and rotation. We will use sockets to attach our weapons. This documentation from Epic is ideal place to learn about creating sockets and previewing meshes. I won’t be posting about how to create sockets – please read documentation. If you are previewing your meshes in sockets don’t be afraid that they won’t fit exactly to hands. We will be using AnimationBlueprint to fix that. 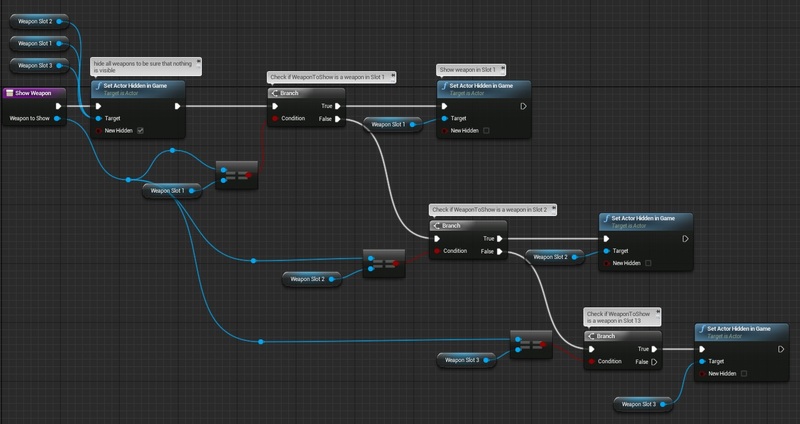 Animation blueprints controls how skeletal mesh will animate. 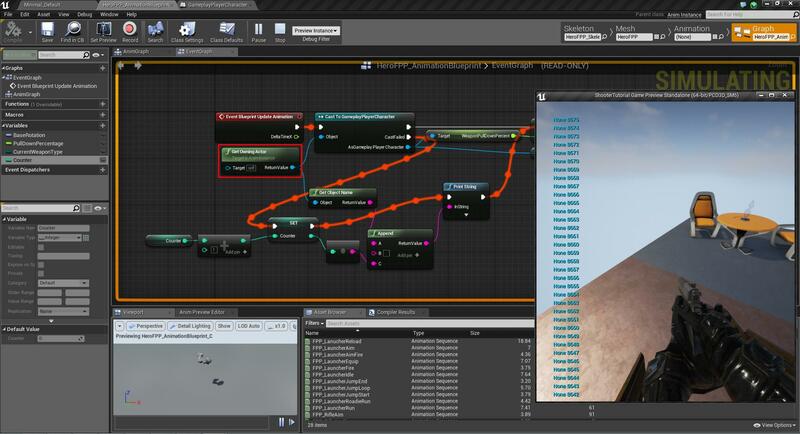 It can take data from owner (in our example it will be GameplayCharacter) and use it to drive animation. Please read Epic’s documentation before moving forward. We will be assigning those variables in Event Graph. Then it’s connecting it to slot Normal, slots are mostly used for playing Montage Animations. If montage will be played it will go here to this slot. Please watch this tutorial form Epic. If you have time you should watch the full playlist. Montages documentation can be found here. Then it’s caching the pose to new cache called BasePose so we can use it later. Now we need to blend pose by Enum – by our WeaponType. You will be able to fill all of the TransformBone blocks but there is a new block called TwoBoneIK. Basically what it’s doing it’s taking b_LeftForeArm and trying to change bones location to focus on b_RightHand. If you select this node in Event Graph you will be able to change the location! I’m using it to change left hand location to hold the weapon. TwoBoneIK is powerful and you should learn it! Here you can find the whole animation blueprint. That’s all in Animation Blueprint! After variables let’s move to functions. This is helper function to hide and show weapons in slots. Those are all functions for now. We need to create one Custom Event in Event Graph because we will use Timeline to drive equip animation. We are using Timeline. If you don’t know what’s Timeline please read Epic documentation. Our timeline is driving float variable and a event. Basically it will tell AnimationBlueprint to rotate hands down and up. When hands are down we are firing event to show the weapon we are equipping. The last thing in Event Graph is to create key bindings for 1,2,3 and fire EquipWeapon event. Take your time to learn animation blueprints and object oriented blueprinting. Implementing game is taking time but writing about this is taking much more effort! Thanks for your great tutorial. what should i do ?Is there anything that i should do ? “The last thing in Event Graph is to create key bindings for 1,2,3 and fire EquipWeapon event.” – this need to be done in GameplayCharacter. Make sure you have added this “Now if you want to test this out just add a button to UI_Debug_WeaponSelection like this one:” to your button in UMG. It’s hard to say why it isn’t working for you – if you can send me your project on mail: shootertutorial@gmail.com and I will be able to take closer look. I sent an email with subject “My Project”. I think the problem is i have not used IndexInBackpack variable but i don’t how to use it and it’s not in this tutorial(you created it in this tutorial but you didn’t use it anywhere). Im having this exact same issue. Thanks! Will open your project Tomorrow, and let you know! Did you read previous tutorial about inventory? http://shootertutorial.com/2015/06/06/how-to-create-inventory/ Equipping won’t work without inventory. Yes i did . 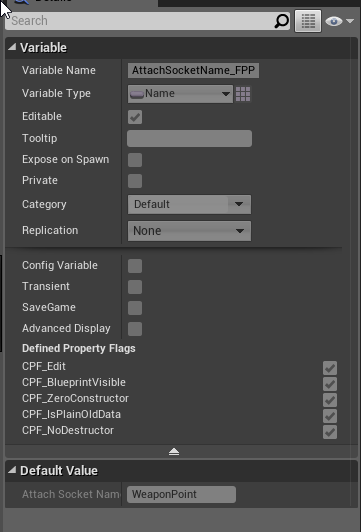 I also used your blueprint folder and everything was ok but in this tutorial the only problem is when i choose textures in inventory(like you did in gif)for my weapons it doesn’t do anything and everything is fine like selecting and deselecting. Im having an issue where in GameplayerCharacter > SpawnWeaponsAdnAssignToSlots when trying to spawn the actor for each weapon slot. 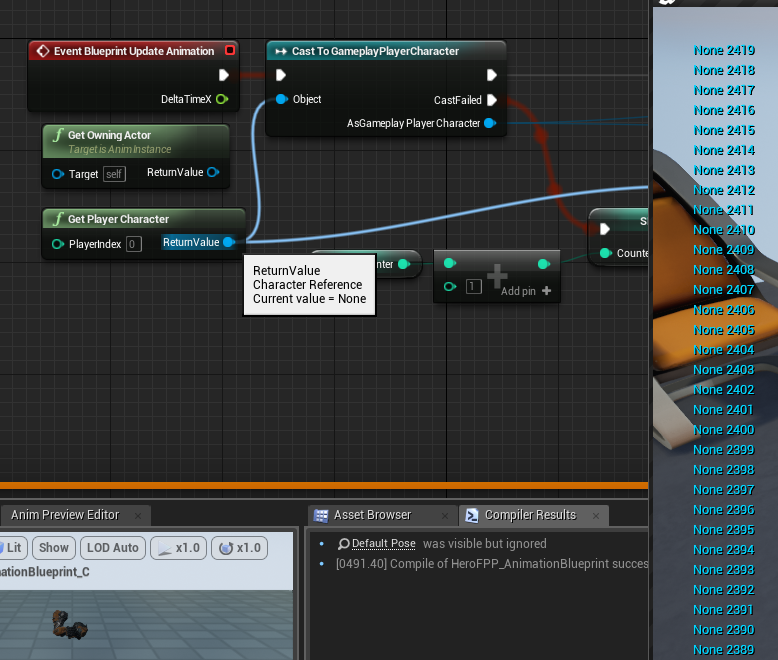 In the picture you provided the SpawnActor node has an Index in Backback input integer, but I have no idea where that came from because it is not included in my project, and it wasnt created anywhere else. Here is a picture. It’s an issue with Editor – will post that in Answer Hub. 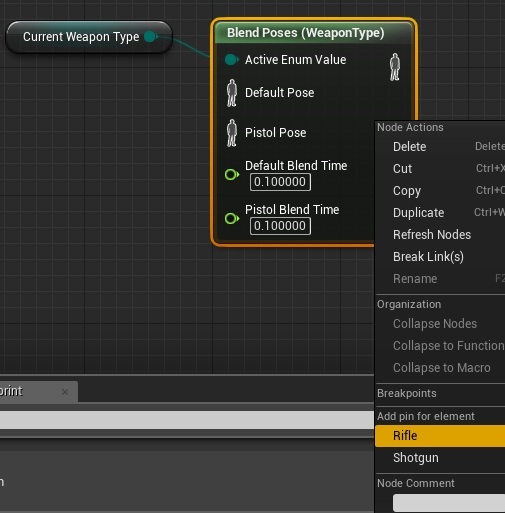 What you need to do is to create node Spawn Actor from Class and select BaseWeapon as a class. Then you should see Index In Backpack int (if you had selected “expose on spawn”) and you just need to connect Weapon To Spawn to Class. It will work. Editor doesn’t see currently which class you are extending if you are moving from wire. I will post here screenshots step by step how to do that, but I’m out of my computer now. Thanks I got it working, but Its still not showing the weapons when switching slots. I got the same problem with switching weapons. Could you say what the problem? Hi it’s hard to say – it’s working for me. You would need to send me your whole project to shootertutorial@gmail.com and I will be able to check. In the meantime here you can downloads my blueprints folder: https://www.dropbox.com/s/6oi4gx9n6uumjcu/Blueprints.rar?dl=0 check if you have everything exactly like I have. I sent you project. Thanks for your help! can u please explain, detailed if u can, how did u solve that ? If you have the time, could make an v2.0 weapons equipping without inventory ? (just have to press a key to get the weapon) 🙂 ? can you please put a link to download your project ? i’ve followed all the tutorials but i cant figure out why weapons dont show up, may i send you my project ? can u help me ? thanks for the great work, keep it up man, u are awesome ! Hey everybody! I’m so glad, i finally did it. But everything you need to succed is in the tutorial! When you are going to do the step: “Updating WeaponBackpackItem structure”, there is a “USEFUL TIP”. Well it’s not really it Tip, it’s a MUST DO! In your ShooterGameInstance is the Function “SetBackpackItemseleted”, there is one connection destroyed when you change WeaponBackpackItem to structure. It’s between “BreakWeaponBackpackItem and “Make WeaponBackpackIteam” – the purple guy! remake this and everything will work totally fine! i have already do this but my error stay, could help me ? Are you assigning current weapon in GameplayCharacter? Thanks, you helped me a lot ! Yes, in the equip weapon just after “Show weapon” function. Before I ask my question I just wanted to say thank you for this tutorial, it’s been really helpful for getting started in UE4. My question is that (like another user) when I start my game I don’t see my guns and my 1-3 keys don’t do anything. I used a different arm rig and weapon models (but I made sure to adjust everything correctly), could this be the issue? I wanted to say I fixed my problem. I forgot to add the weapons in Backpack Weapons. Good tutorial! When i press “I” for the inventory, all works, selecting guns, changing with 1,2,3… but when i press it again and deselect from the slots, the gun mesh dosnt disappear, can you help me? thank you! First of all thanks for taking the time to make these tutorials, secondly if you are going to use paid assets next time you may want to mention that in the overview first so people don’t waste their time following a tutorial they cant finish. It’s entirely possible import weapons yourself. I got a few models from GameBanana’s Dev Hub and created my own animations. From there you can add the sound/effects in yourself. Hey men how do you create the animations? there’s any tutorial on youtube that you reccomend me? I found you get much better results using the rifle idle animation for the base pose and rotating (no translation) the left shoulder bone. Using a Two Bone IK on the left forearm makes the left hand clearly lose sync from the gun when the idle animation is running. That’s the spirit! I really suggest to just take your time and play around with UE4. Create your content don’t copy everything from ShooterTutorial – this is only inspiration! Good luck! As other people said, this is straightforward. If you find problems, try to advance to the next section of this tutorial, and come later for the past one. 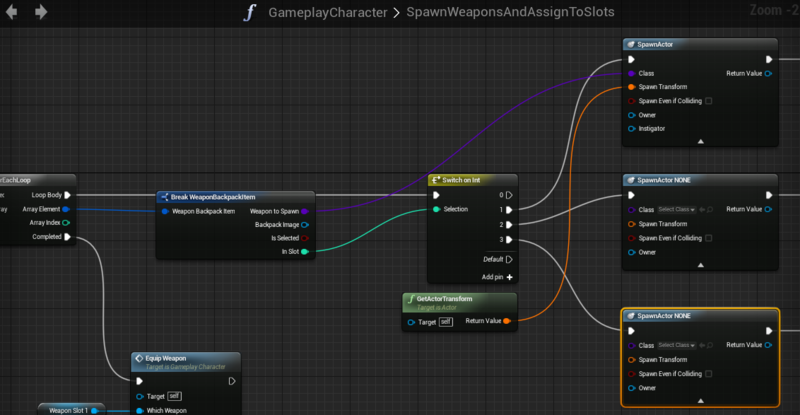 -That all the blueprints are like the images (especially after you change WeaponBackpackItem). -That you added the weapons at BackpackWeapons. Despite everything working, I noticed the GetOwningActor node in the HeroFPP_AnimBP returns “None” ? Even GetPlayerCharacter is giving “None” from the AnimBP, as I am controlling it. How is this possible? You need to use Get Owning Actor which will return you your Character and then you can get Controller using this Character. So I found this question on the answers site, where the guy states that the cast only fails when the AnimBP is open. (I know, crazy right?) but wow, as soon as I close the animBP editor, no more cast fails. I did notice something else though, while the AnimBP is open, it actually both succeeds and fails in near equal portion. If you then switch focus to another window (Making Unreal run in low priority mode) there are only cast successes, and when retaking focus, the fails return. Pingback: How to add weapons – basics + equipping | Dinesh Ram Kali. with this, all functions worked, but i have a issue with deselecting the weapons from slots. They don’t remove from slots and 1,2,3 keys do not everything, but in inventory, i can all weapons select with no problems. Maybe, i have forgotten yet? Can you help me wit this problem via e-mail? Hello Bredock, I have the same issue as you. when I am assigning weapon for the first time it assign correctly, but if I want to change weapon in inventory in slot2 with other weapon, first weapon doesn’t remove from view. So could you help and say how did you solve the problem? So i figured out with the 1,2,3 keys, it worked, but there is aother problem with the equipping weapon. When i equipt, i lose the launcher_aim animation what do i wrong? Maybe when you were adjusting your blueprints you disconnected something that controlled the animation. The last Button you have created, where do you adjust it in the UI_Weapon_Debug_Selection inUMG? for that button not the button himself in UMG. Can you share image screenshot Create Normal Motage Anim ? I have problem, it’s not show weapon when im trying 1, 2, 3 or use Inventory. I’m trying catch fail in Equip Weapon Function. I had this problem, the solution was to ensure that in the AttachActorToComponent nodes, in the SpawnWeaponsAndAssignToSlots function: ensure that Attach Location Type is set to SnaptoTarget, Keep World Scale. ALso, in the SpawnActor Nodes, ensure they are set to Always Spawn, Ignore Collisions. Hello, i am stuck on that play equip weapon anim. How to do? Please help. I did the tutorial, and maybe it’s just me but as I saw it the SpawnWeaponsAndAssignToSlots function is done, but never used. That was the thing that prevented me from spawning the weapons. I inserted it to the beginning of the EquipWeapon function, so all the weapons are assigned to the slots before equipping. Not really optimized, but it’s working. About the models used: The third tutorial began with moving assets from the ShooterGame, so the weapon meshes can be re-used from there. Also, I would like to thank ANDRZEJKOLOSKA for the awesome tutorials, they really help in learning for my projects. Keep up the good work! Can someone explain me how did you get Current weapon and from there Weapon type variable? 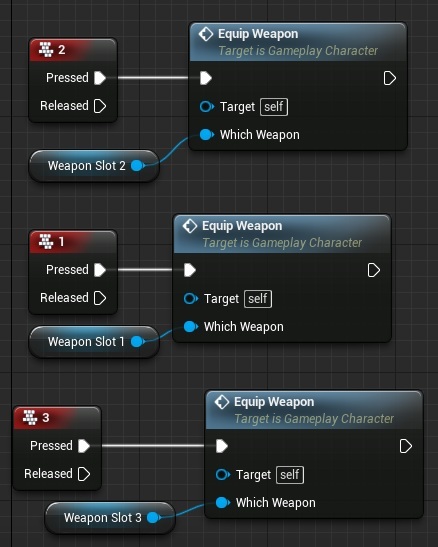 Add Current Weapon as a variable(Type of variable “Your characters blueprint name as reference” in Your Characters Blueprint example mine is FirstPersonCharacter, I think this step was skipped or was in a previous tutorial. https://gyazo.com/2d1ca19267888ec12a9ab0a44fd9c6d6 like this? then how do i get access to weapon type? Do i need to create “get weapon pull down percent” and “Current weapon” variables ? Yes in GameplayCharacter. It was described in earlier tutorials. Always read Shooter Tutorials from first Tutorial. No i re4ad from first tutorial but you dont show how add this 2 variables! It comes later in the tutorial, I believe he either expects you to know that or just go along with it. I just followed each step carefully but the weapons doesn’t appear. Maybe the problem it’s in the Spawn Weapon function ? Look the ”attach socket” variable node. wtf? im done… could someone help me? Hello brother. Sorry to bother you. Can you help me ? The weapons doesnt spawn when I press the 1,2 or 3. Hello. I’ve tried this way. But it keeps wrong =\. Any suggestion ? Thanks in advanced. The weapons don’t spawn in the players hands. They spawn at the players feet (kinda?) and when the player looks around, the weapons revolve around the player, and adjusting it’s position and rotation to the character. Also, they don’t “move along” with the players hands, so even if they would spawn in the players hands, they would hang still while the players arms play the Idle animation. Anyone got any ideas on how to solve this problem? Hi, whilst I appreciate the shear hard work you have put into this tutorial I have to say its one of the hardest I have encountered to follow. Using just youtube I have managed half the things on here in a quarter of the time. On some of the tutorials you advise to do things later on that should have been done before, its abit of a mess. Yea I’m aware of it 🙂 Stay tuned for free online book that will cover all of the things but with much more explanation which you can see in latest Tutorials. I can not assign the variable type to “WeaponPoint” Nothing pops up with that name. Please help!! Hello I’ve got problem, can you help me? thank you for your attention and sorry for my english I’m french. Anyone knows a good free weapon pack for someone who can’t really afford to pay $30 to follow a tutorial? In “GameplayCharacter” -> “SpawnWeaponsandAssigntoSlots” when I “Break WeaponBackpackItem” the “InSlot” always sends a 0 to the “Switch on Int.” This is causing no weapons to spawn on the character. If anyone has any idea why please let me know. Somehow I managed to Solve the Weapon not appearing problem… But what the problem I am getting is that it does not spawn pistol and shotgun but only the rifle …. My weapons wont disappear after you deselect them in inventory, ??? ps make sure you only use 3 weapons till you get this working (was giving me issues) 0-1-2..
Email if you have fix or a working copy up to this point… really need to get this for UNI… i well after the initial hurdles of some engine issues 4.8.3 are not the same as 4.8.2 and…. 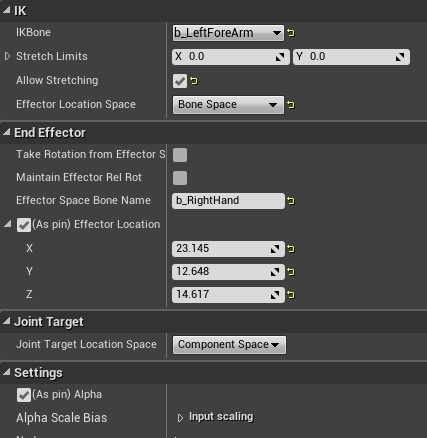 4.9 only allows the FFPMESH arms from the shootergame package to be imported correctly. other version gave issues.. Thanks for it to this point i happy to have 1-2-3 working and switching weapons, so i will continue and maybe the removal of them wont be too big of a fix and destroy what i continue onwards..
Where did FPP Mesh come from? 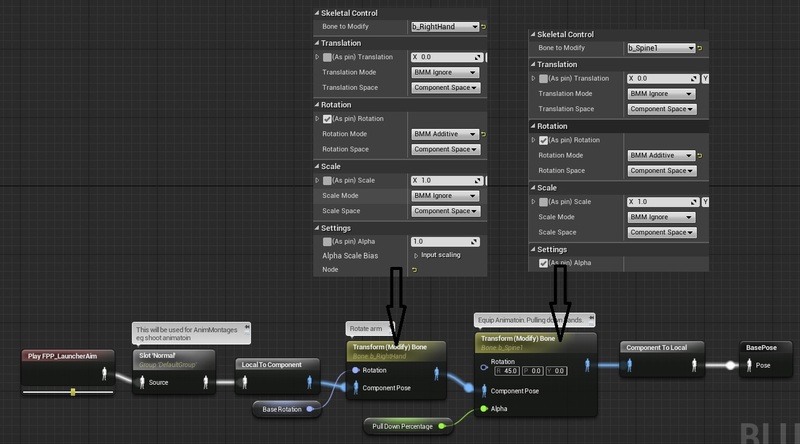 I’ve been following your tutorial since Part 1 and haven’t seen that mentioned, where do I make that node at? Where did the node FPP Mesh come from ? I’ve been following your tutorial since part 1 and never seen you mention that we need to make it. Anyone getting errors saying their weaponslot_x in SpawnWeaponAndAssigntoSlot is none? I having a hard time figuring out why it isnt geting assigned somthing, where exactly are they getting assigned? Im having an issue where the weaponslot_x in my SpawnWeaponsAndAssignToSlots function is returning as none, anyone able to figure this out? Im guessing this is the reason why my Weapon doesnt appear. I have no idea, might be something with the animations.. but it’s not working, and I contacted the creator of the tutorial series, sadly he doesn’t have time to help me out, so I’m hoping someone out there might have managed to get it working, and can help me out.